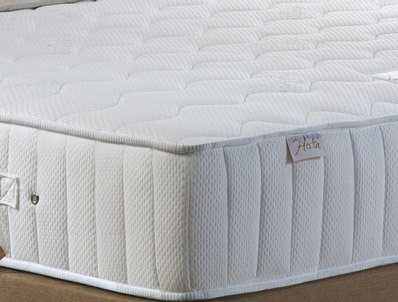 The New Hestia MC Memory Range 1700 pocket mattress offers a lovely medium Comfort feel and this is because unlike other pocket & memory mattresses this Hestia mattress has a 5cm layer of High quality V60 memory foam. Below the memory foam layer is a 25mm layer of high resolution standard foam to help protect the 1700 pocket spring layer. This mattress is further enhanced as it has a solid foam wall around the outside of the mattress giving it a firmness and rigidity at the sides , the top cover is quilted and has been in covered in a soft knit fabric that has been treated with an Adaptive cooling fabric.